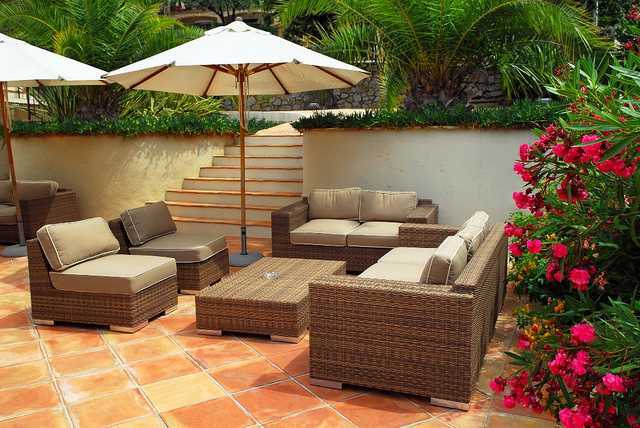 Outdoor furniture is a great investment that should give you pleasure for many years. Before you make your final purchasing decisions, here is the beginner’s guide to choosing easy-care, long-lasting backyard pieces that will make outdoor living even sweeter. Aluminum is rust-resistant and lightweight. It is tough and durable and for this reason it can withstand wear and tear. Furthermore, finishes adhere well to aluminum. This is important if you think that your outdoor furniture may be exposed to harsh weather and moisture. There are a lot of finish options and colors, too. Iron is the heaviest and strongest of all metal furniture and definitely won’t blow away. However, chairs with iron frames require cushions for comfort. In addition, wrought iron my need occasional paint touchups, since it is rust-resistant rather than rust-free. Wood is a natural alternative to plastic or metal. Furniture made of wood will require more maintenance in order to protect it from the elements. Teak and cedar are great choices since they naturally resist insects and rot. Although steel is stronger and heavier compared to iron, it is not as heavy as iron. Furniture that is framed with steel is quite durable. Wicker is suitable for both outdoor and indoor use. This makes it an excellent choice for decks, porches, sunrooms or patios. Wicker also works best with cushions. Plastic (or resin) is lightweight, inexpensive, durable and easy to clean. Resin chairs can be used with or without cushions. Dining sets are the best for enjoying meals alfresco. You will be able to accommodate family and friends with anything from five- to nine-piece sets. Look for an extendable dining table, if you only need a large table every now and then. Wood or upholstered chairs give the same comfort as dining indoors. Bistro sets are available in almost all materials and are ideal for small spaces such as breakfast nook, apartment patio or balcony. Go with a cushioned set for added comfort or a wrought iron set for a classic look. Bistro sets can be dressed up with decorative seat cushions and come in standard and balcony-height. Conversation sets give you the comfort of the living room outdoors. A few conversation chairs with an accent table and ottomans adds a nice sitting area to a porch. Look for a loveseat and coffee table set, if you have a large family, so everyone has room to spread out. Depending on the occasion, modular sets can be grouped into different configurations, making them great for entertaining. Sling-style and cushion chairs are two of the main seating choices. They can do duty as dining chairs. Woven and caned seat options are comfortable as-is or with a cushion. They go great in pairs with a small accent table. Decorative seat cushions are available for many chair types, if you just want a pop of color or extra support. Many seats come in children’s sizes and chairs are available with low, mid or high backs, too. Today, accessory pieces include swings, gliders, benches and garden stools. Collections offer conversation chairs with matching loveseats, sofas and ottomans, providing all the comforts of indoor furniture outdoors. Treat yourself to a hammock for the ultimate in relaxation. You can change the look of your furniture with cushions without replacing the entire piece. Look for cushions that are mildew- and fade-resistant, washable, and waterproof. Materials range from polyester or PVC-coated fabric to cotton-blend fabric. Additionally, make sure to match the proper cushion size and style to the chair. Gazebos, pergolas and canopies crate a dynamic look and give you a break for the heat while enjoying the outdoors. In order to round out your deck or patio ensemble, pair coordinating tables and umbrellas. Tables come with tile, metal, wood or glass tabletop options so you can choose the surface that best meets your needs. In addition, do not forget the rugs, the unlimited variety of outdoor décor accessories, and outdoor heating to give you the ultimate outdoor living space.